In previous years, we’ve done the Dumb Run, and it has been good. It has been great. I have splendid memories from those rides, from Will yelling “WILDFLOWERS AND SHAME” at the sleeping citizens of Linlithgow at 3am, to the little guy in hi-viz who threw a total hissy fit at us for taking pictures of jelly babies on the Forth Road Bridge at 4am. But this year is different. This year I don’t have the motivation to ride a train all the way to Dumbarton, ride a bike to St Andrews, then ride in a car all the way back up to Aberdeen again. Frood doesn’t have the motivation to drive all the way down to St Andrews at silly o’clock on a Sunday morning, just so we can have coffee and beer at the side of a golf course. He’s not keen on being the calamity wagon if it’s going to take him 3 hours just to get there. A couple of years ago, the LGC mooted the idea of the Aberdeen Assault – in addition to DR, not as a replacement. Well, this year it is the replacement. If this is as nice a ride as I think, this is likely to become my replacement overnight Solstice Century. Most of the people who have done the DR in the past are either east coast folks or have been staying with me as a guest, so this is equally convenient. 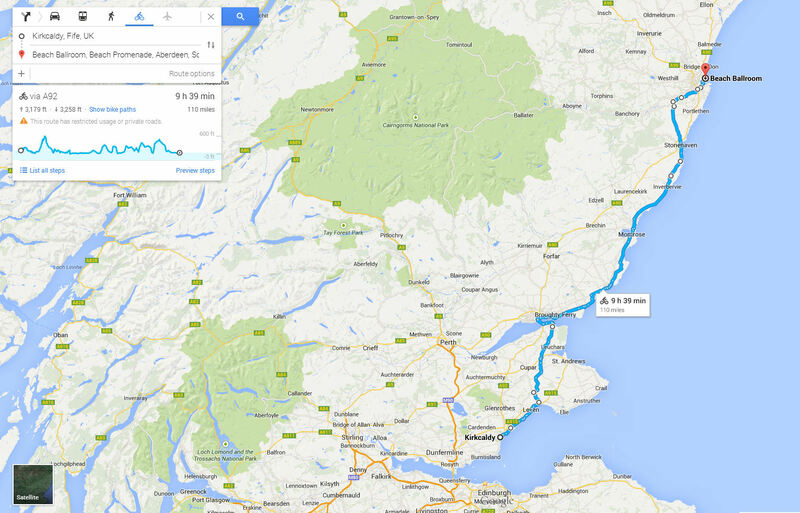 Aberdeen has better transport connections for the return trip than Leuchars, and the scenery will be much better. I’ll report back and let you know how we get on.